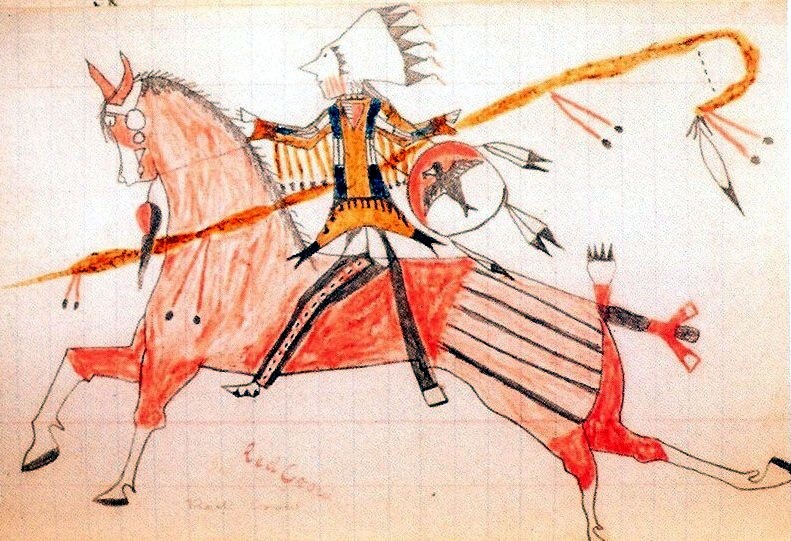 Ledger Art evolved from Plains Indian hide painting. Traditionally Plains tribes decorated tipis, leggings, buffalo robes, shields and other clothing items with depictions of life events. The figures were usually drawn with a hard, dark outline and then filled in with color. The painting was done with bone or wood sticks that were dipped in naturally-occurring pigments. The women of the tribes often made designs while the men depicted scenes of war, hunting, other personal feats or historic events. Besides battles, the changing lifestyle of the Plains Indians and infusion of Euro-Americans was documented in the art – trains, covered wagons, guns, and even cameras. Ledger art began in the 1860s and continued to the 1930s and is experiencing a revival with a few contemporary Lakota artists today. It is called ledger art because instead of the paintings being on buffalo hides (which had become scarce from near extinction of the vast buffalo herds) the drawings were done on paper, often ledger book paper that was discarded by government agents, military officers, traders or missionaries. In addition to the new paper format, Plains artists also had access to pencils, pens, crayons and watercolor paints. An 1884 crayon ledger drawing by Lakota artist Red Dog honoring the valor of a warrior named Low Dog. Noted Lakota artists include Black Hawk and Sitting Bull. Black Hawk, in an effort to feed his family during the very harsh winter of 1880-81, agreed to draw a series of 76 pieces of art for an Indian trader that depicted one of Black Hawk’s visions. He was paid 50 cents a drawing. That book of 76 drawings sold in 1994 for nearly $400,000 dollars. Although not technically ledger art since the drawings were on new lined paper, not ledger paper, Black Hawk’s work are one of the finest examples of that style of Lakota art. Two examples of that series are shown below. Contemporary Lakota artist Alan Monroe uses traditional ledger-style designs on rabbit skins. There are many types of sticks used in Native American ceremonies. The hai detoi is a stick of madrona wood with feathers on one end and a flint on the other – it is used by a Pomo (Northern California) shaman during healing ceremonies. A hatcamuni is an Acoma Pueblo prayer stick. It is made by the individual (or an individual’s family member) that is requesting healing. It is cut from a live willow or cedar, may be notched or painted and might have feathers attached to it. Lakota Horse Stick – To the Lakota and other Plains Indians, the horse was a working partner that provided transportation when moving, and a heroic companion on hunts and raids and in battle. When a warrior lost a horse, he would honor the horse by making a horse stick. The effigy would represent the likeness of the horse and be decorated with markings and adornments that recounted the life and achievements of the horse. The horse stick would then be carried by the warrior in dances to pay tribute to the great horse before other tribal members, most notably those of the Horse Society. By making and carrying the stick, it was hoped that the spirit of the horse would follow the warrior in life and give him added strength and power. The horse stick was usually made of wood and decorated with paint, leather, fur, feathers, beads and other items. 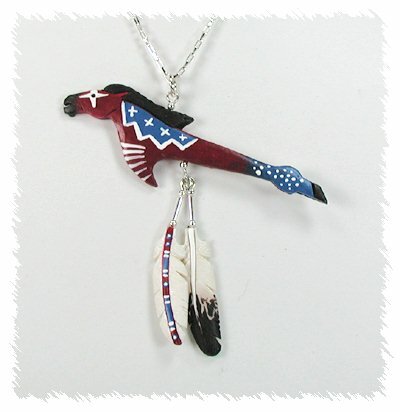 The horse stick pendant (above) made from bone was hand carved and painted by Lonny and Michelle Cloud.